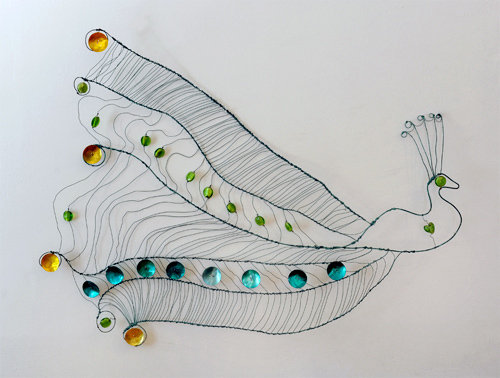 Copper wire sculptures that lift the spirit. 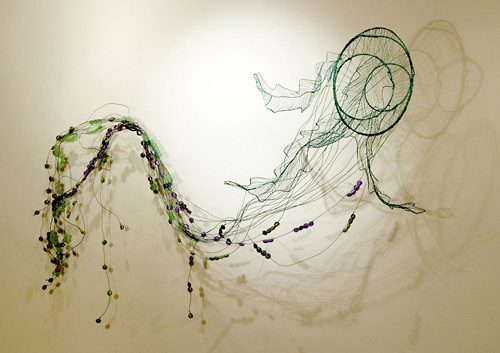 Sculptures that evoke the wonder of nature and its creatures; leaping salmon, smoothhound sharks, birds of paradise, and golden mane jellyfish. Copper wire, glass beads and mother of pearl.The copper wire can be oxidised turquoise/ verdigris or lacquered at a high heat to keep the raw copper look. How should I display them? The sculptures can be free standing or hung as mobiles. They are very light & portable. They can hang above an island in a kitchen, from a tree in the garden, or against a living room wall. They are affordable, beautiful and joyous! Susan has been voluntarily installing art in her local, community hospital; St. Columcille’s, Loughlinstown, Co.Dublin, the former 1841 workhouse. Well wishers have been very generous with their donations, especially Avoca Handweavers. Solo show, selected group shows, collections etc.